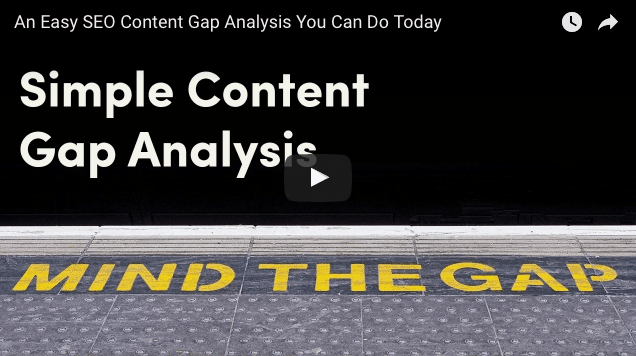 A content gap is exactly what it sounds like – your competitors have content that you don’t, creating a gap. Not just content that you lack, but content that they are ranking for that you would like to rank for. Sometimes when you’re beating your head against the wall why am I not ranking with this keyword, a lot of times if you really look, you may not have the best asset on your site to actually rank for that keyword. I thought we would look at a live example and show you a tool that I use to make this process much easier. I figured it would be super exciting if we were to check out tire companies, right? Because yeah. I’m here on Goodyear’s website. That’s the tires I have on my car right now, so I started with them. We are going to look at how they compare and what content gaps they have against some of their competitors. The tool that I use for this is ahrefs.com. It is a paid tool, but they do have a free trial. I’ll double check on that but I’m pretty sure that it is. They are an industry standard SEO tool. For today, we are just going to talk about their content gap feature. They have come out with this feature and it has made it much easier to identify where these gaps exist between you and your competitors. When you click content gaps on the left menu, it is going to pre-fill it. And what it’s going to ask you for is to put in domain names of your competitors. And this is pre-checked. You probably want to leave it checked so that at least one of these targets that you put in rank in the top 10. What’s cool is you can also add in additional if you want. Now, I’ve already filled this out. I have put in Firestone, Cooper Tire, and Michelin. Hit Show Keywords and there are around 8,000 keywords that are showing up where one of these competitors– in this case, a lot of them seemed to be Michelin are ranking but Goodyear is not. This is an excellent way to find content gaps. Now, what you will find is when you’re looking at large brands, the branded terms tend to carry a lot of weight. What I would do here is look from 100 to 4,000 search volume (monthly searches). After it updates – We have 1,600. Still, it’s still a lot. Let’s go three words and up, just to get some of those shorter phrases out of there. We are left with 1,200. You could keep playing around with filtering. I will say I wish that they had a way for me to enter in a search right here or negative keywords. That would be nice, so if I get– I could take out branded terms like Cooper. I’m actually going to shoot them an email. They’re very responsive. They may have that on their roadmap already, or maybe they’ll implement it once recommended. They have a very responsive team to suggestions. Since that is not available right now – to easily get rid of Michelin and these things and get to what I want to see, I would go ahead and just hit Export. You can see the data without having to sign up and things like that– I actually created this, copied and pasted over to a Google doc. Feel free to make a copy if you want to play around with the data. I’m not looking for branded terms that if I’m Goodyear that I’m missing out on. I would do things like this: How. Okay, there’s 12 questions. How to check tire pressure. I mean, no-brainer, right? That’s something that if I’m Goodyear, I would want to rank for. Well, they don’t. And what’s interesting is really none of their competitors do except for Michelin, which ranks number four. If you keep going down this, you’ll see this – How often do you replace tires? Nobody’s ranking but Michelin. Over and over and over I’m seeing this. These are content gaps. These are gaps where one competitor is ranking and the rest are not. This is ideation right here. This is data driven. We lack this content. It doesn’t rank. Either we need to revise it– the existing content we have or create new content. You can see just pretty much anywhere you go– need new tires. That sounds pretty transactional, right? I would want that if I was Goodyear. They don’t rank, and again, it’s Michelin that ranks and they are number three. I am pretty curious because Goodyear’s a big brand, so I go over to Google, and I put in a site command. If you’re not familiar with this, this just tells Google only search Goodyear.com. Site Goodyear.com with a colon and then I’ve told it not only we are doing that, I want the phrase “need new tires” in quotes. Goodyear does have this and it appears on the site, the phrase. But it’s probably not quality content, or else it would rank, right? When you click in, it’s– yeah, I mean, look at that. That’s the worst user experience right there. This is what they’re putting out, and that’s why they’re not ranking, right? Now, this is probably some kind of print page or something that’s getting mixed up and probably really even shouldn’t be indexed in this way. But again, it’s a problem. 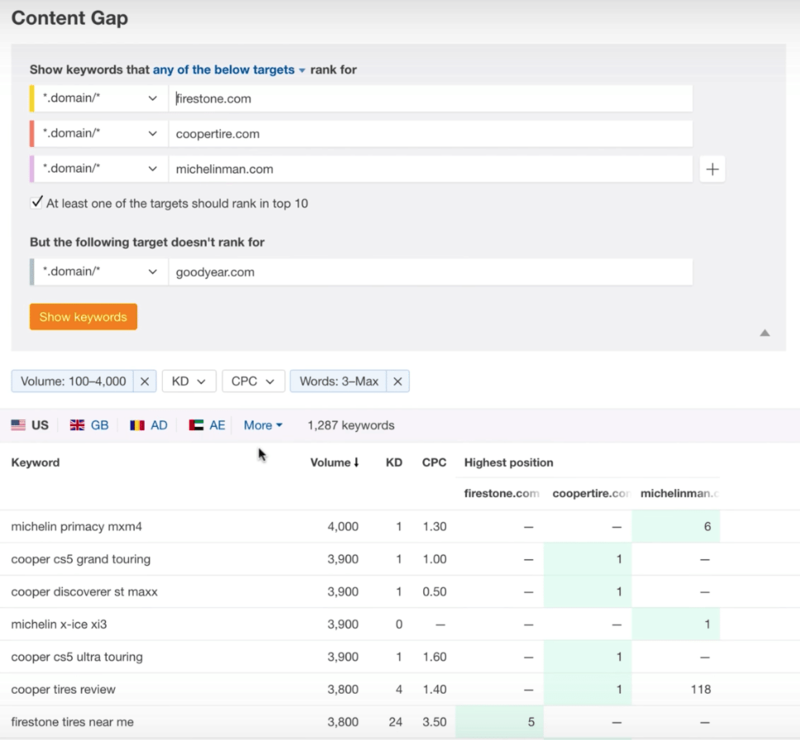 You can easily use a tool like Ahrefs and identify these content gaps and then go about filling them. It’s a simple SEO technique that everyone can use. Leave a message down in the comments if you find that helpful or if you have any specific questions about it further. or hit me up on Twitter (@SEO) I wanted to give you something simple and actual that you could try out right now to have better SEO on your site.